When you put in Google search the term “Budapest sightseeing tour” you will receive 524,000 results – certainly not a little. I have been offered to try one and write a review about it. Firstly, I believe that it is always better to discover cities with a helping hand of a local as they are the people that live in the city, they know it inside out and they love it too (why else would they live there, right?). As the tour organized by Budapest Flow offered the sightseeing tour through the Jewish district of Budapest and the adjacent ruin bars led by the local – Attila, I decided I will give it a try. Budapest is for me a big retro city with a lot of authenticity and creativity both in the public and private sphere and I must admit that the tour only confirmed this perception of mine. 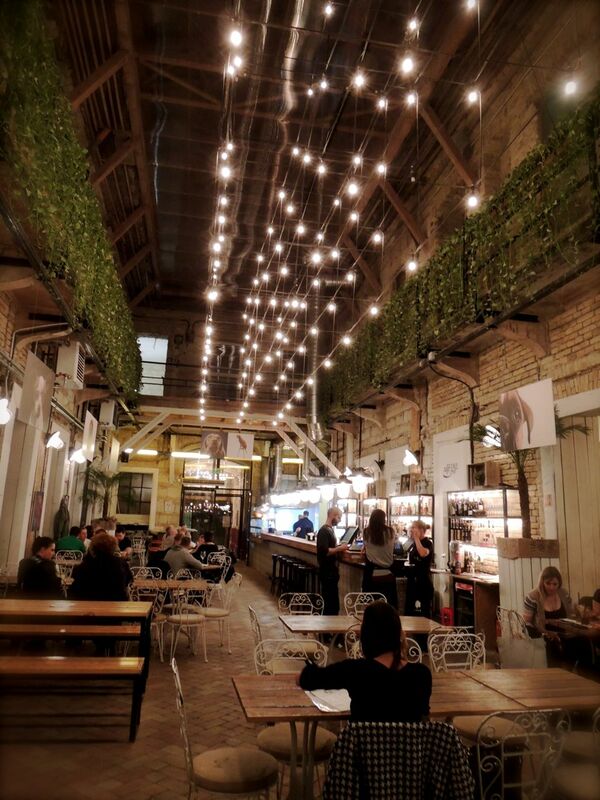 Downtown of Budapest is pretty alternative and hipster place. So what did I see in this guided tour of Jewish district? 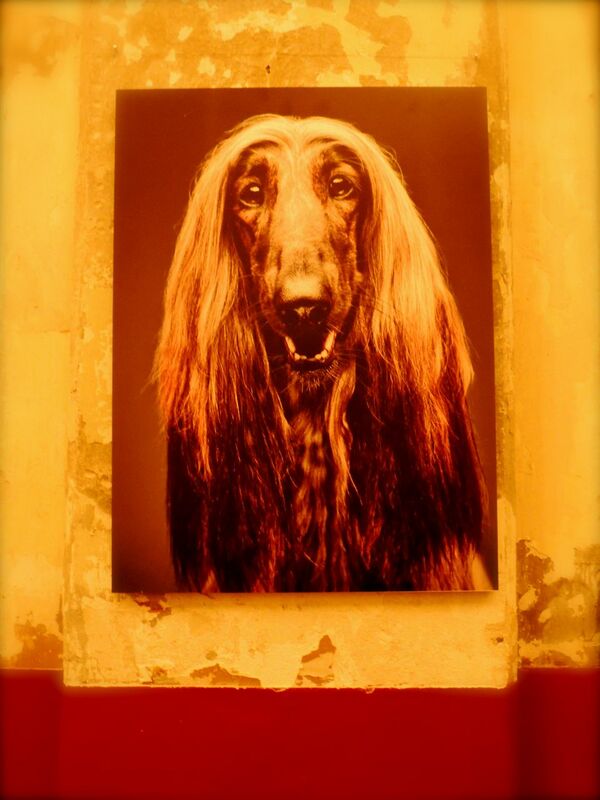 I am a huge fan of Hungarian designers and Wamp design market is a place where I would go regularly for inspiration. 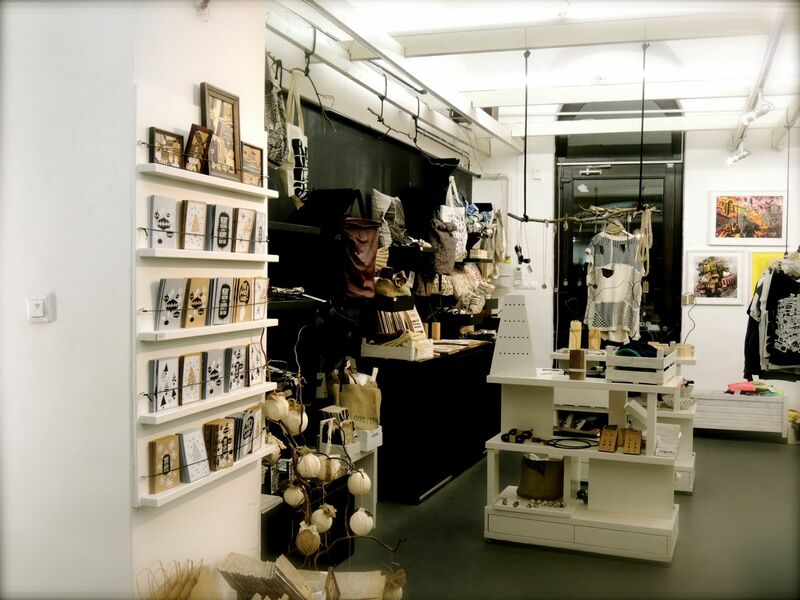 The guided tour through the Jewish district had 2 stops in design shops and if you search for unique and incredibly cute souvenirs then you will not be disappointed! Need spa inspiration? I really liked that one! It is always hard to invite people that live in a given city to tour it and I was at the beginning scared that we will just go to places that I have already visited. And I was happy that I did not know this one before, but I certainly pay a visit there on one of my café working days. Not only they have books by Václav Havel in English, but there is a secret garden in the inner block of the building. Certainly a place to escape the crowded streets of VII. district. As the tour was starting at late afternoon, I did not manage to make any nice pictures of Massolit, because by the time we got there it was already dark. Bocsánat! 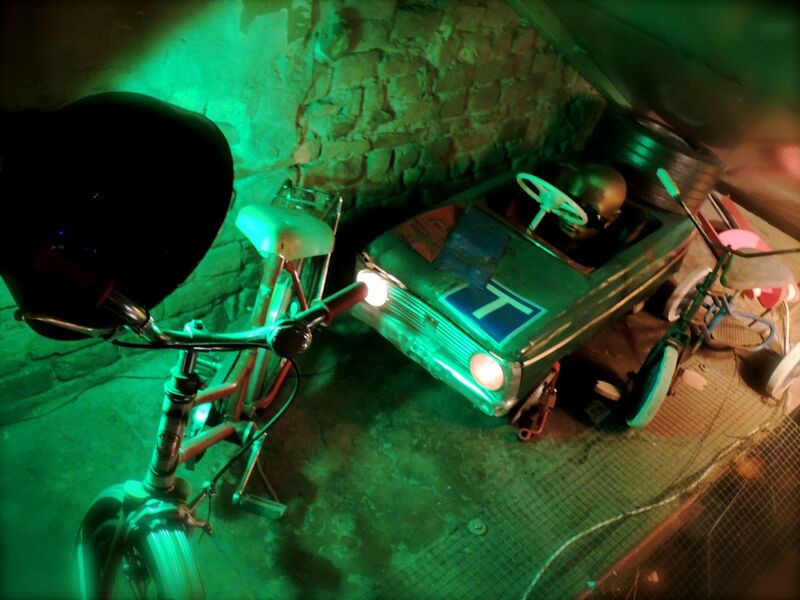 Originally, I was living under the impression that the Budapest Flow tour is only a ruin pub tour, but the guide explained at the total beginning before setting off that this is not an ordinary tour crawling ruin bars with welcome drinks and misbehaving tourists. Fine with me, unlike the tourists, I can visit ruin bars as much as I want since I am living in the city and not just visiting it. Funnily enough, our group had a drink already in the first ruin bar, which we frequented. But that was the only one! 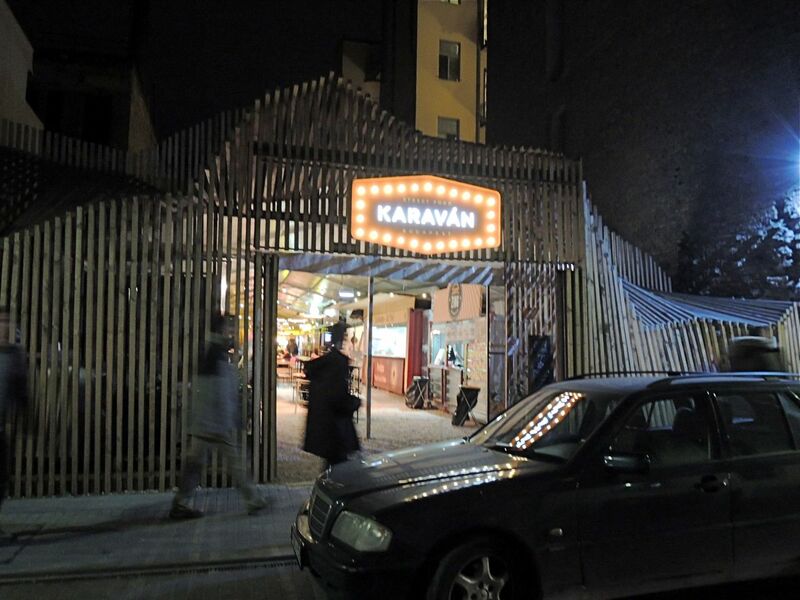 The mother of Budapest ruin bars, the one that started all the fuzz (since 2003). A place that is so popular that it opened also in Berlin. 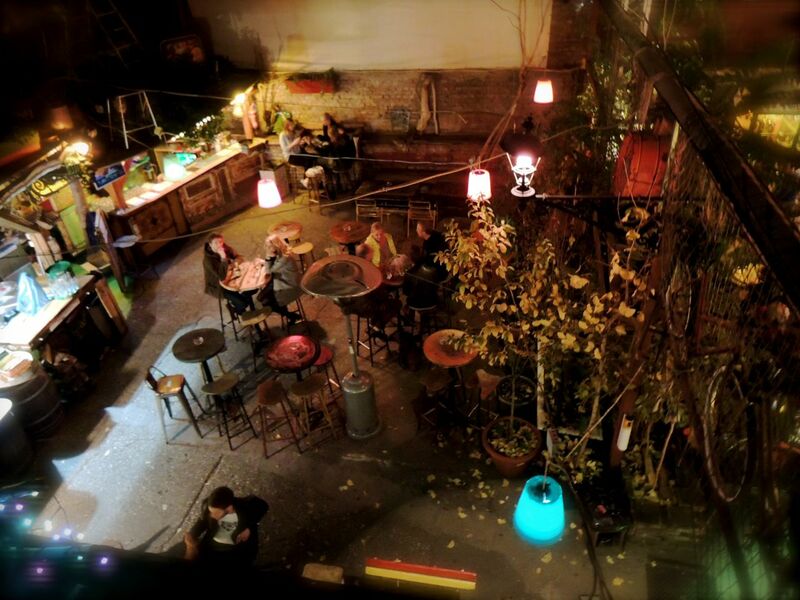 I visited Szimpla kert for the first time in 2010 and I must say that not much has changed since then. Probably the only striking thing is that you cannot smoke inside anymore thanks to the country-wide smoking ban. 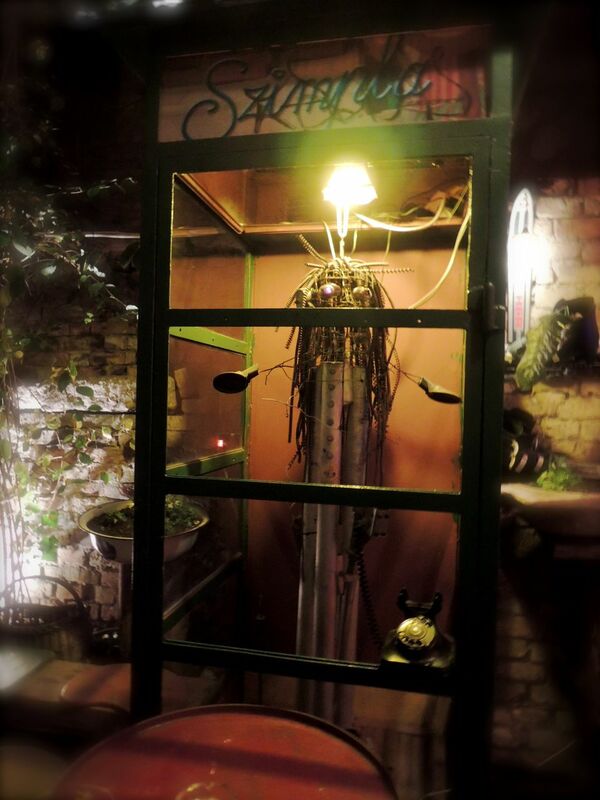 There is still the garden (kert in Hungarian means garden) and vintage decoration, which you cannot get enough of. There is more food (hamburger, anybody?) 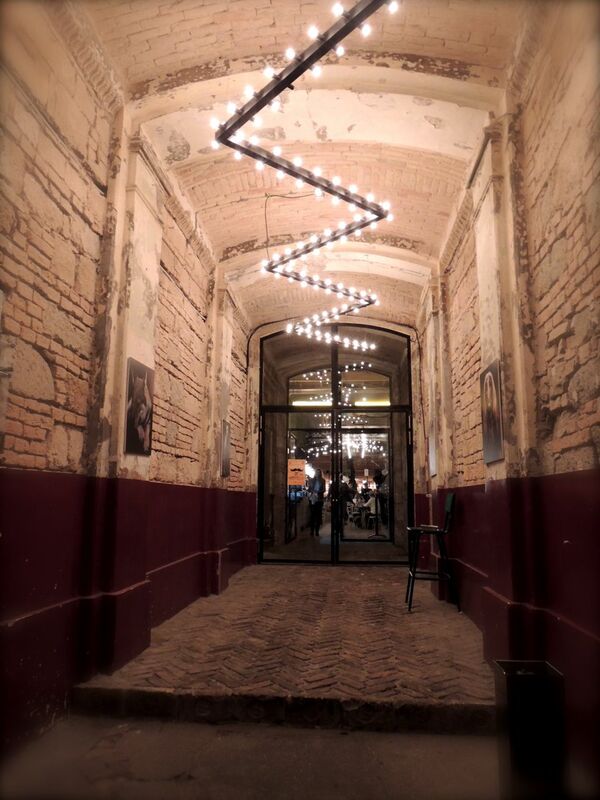 and the whole ruin bar concept is turning into a social sharing and living together experiment – concerts of starting bands, farmer market on Sunday when all the shops are closed unless the owner is working in them, Szimpla guide (get it by the entrance) and own Szimpla craft beer. Attila, our guide has a huge passion for the ruin pubs and he can tell you many marvellous stories about them including details about decorations or things that you would not notice. Telephone booth with a robot? ET calling home! 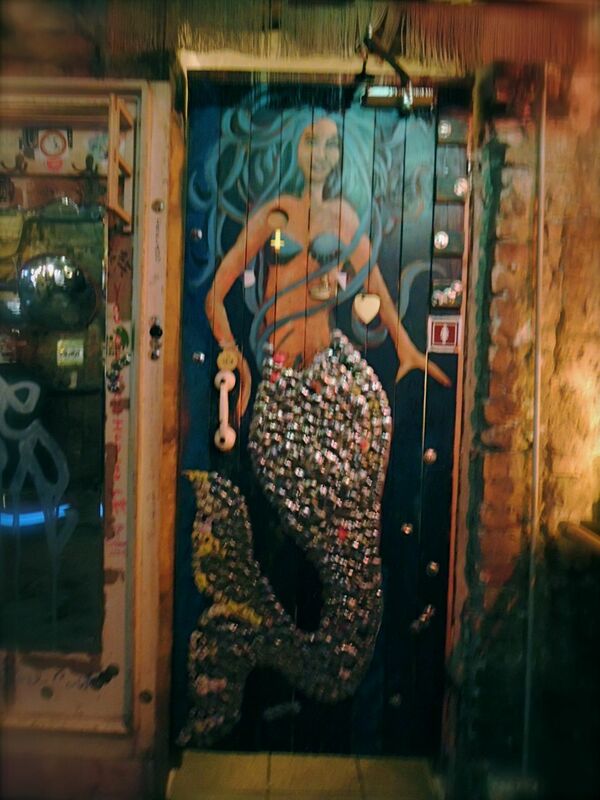 I was adoring this mermaid already the first time I came to Szimpla. I love the telephone set as a handle. 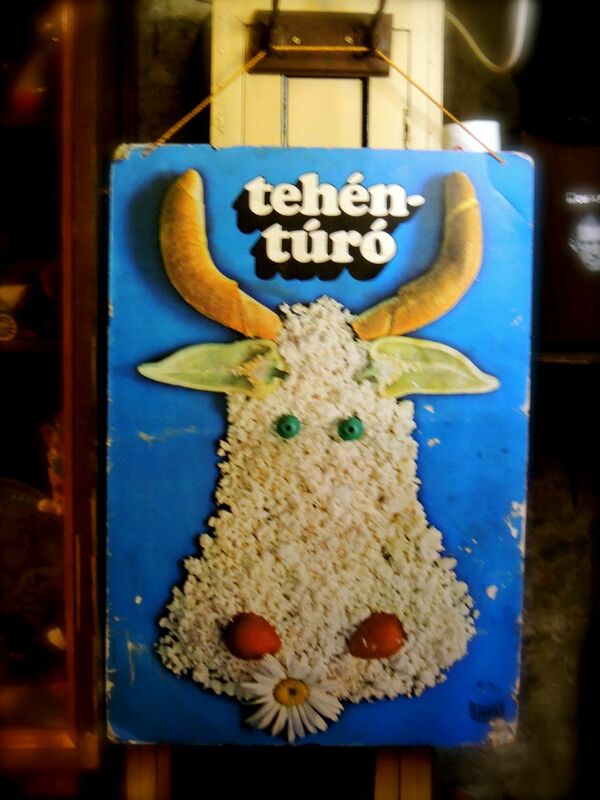 A little play toy that only the chosen kids had during communism. Brings back memories! 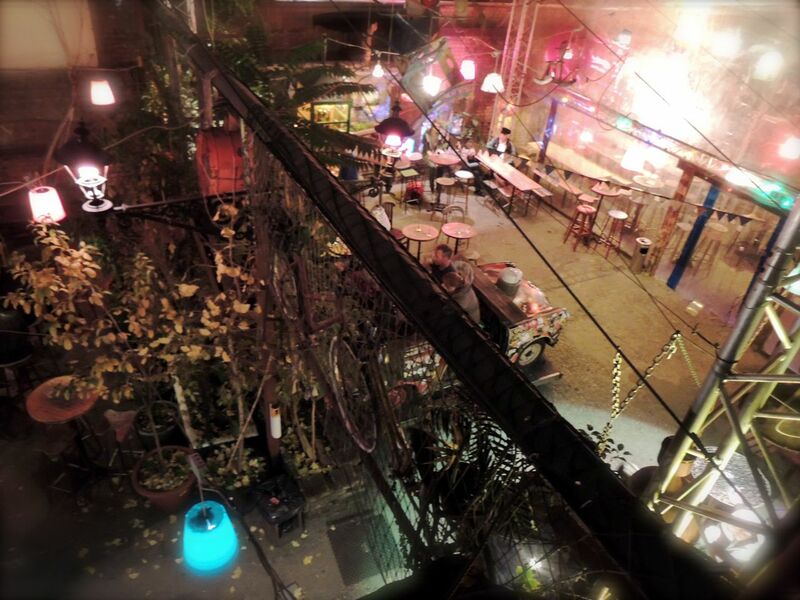 View at Szimpla kert – food options too! Next stop of our Budapest Flow tour was basically next door to Szimpla. 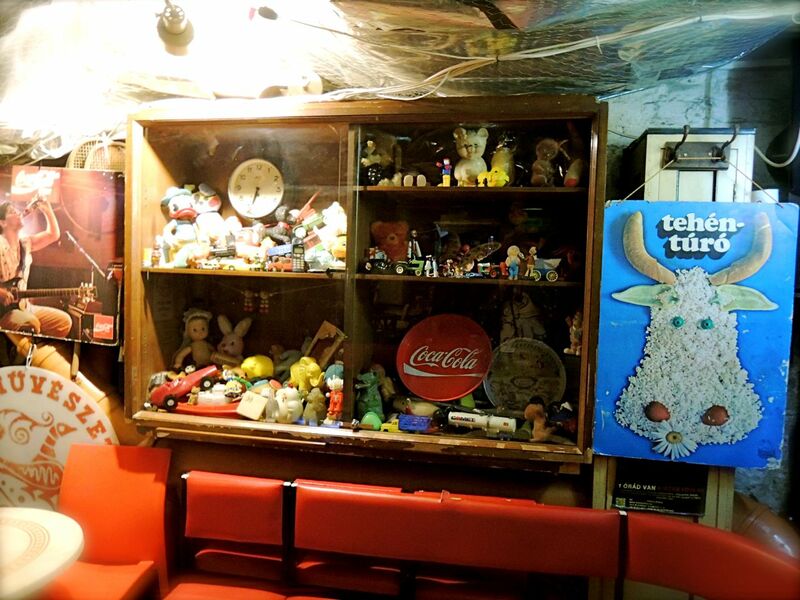 Do not get misled by the nicely smelling food coming from El Rapido, there is an entrance with stairs down, which brings you to the underground pub with a lot of flea market treasures. If you grew up in communism, this is a place that instantly brings back memories. 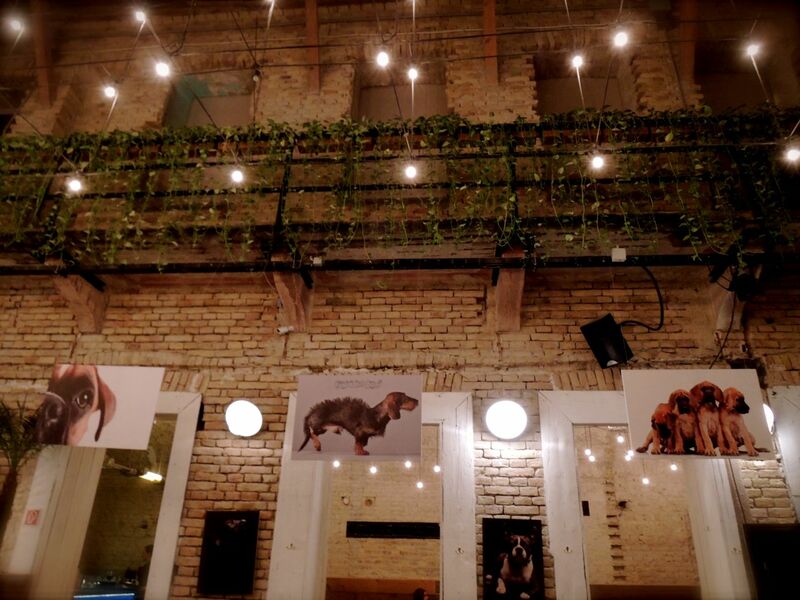 They also have a wall full of B&W pictures of Budapest throughout the history, which Attila can tell you many stories about! These times when there were central advertisements for e.g. cottage cheese. Very creative, indeed. A totally different style of a ruin pub/restaurant. 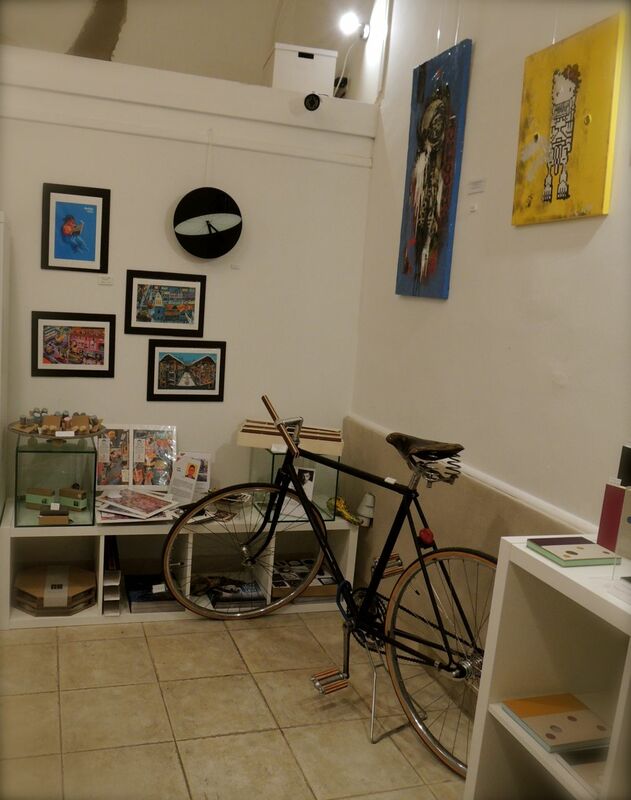 I was totally carried away by the smell and the overall feel the place was giving me. For sure I want to return there (although, I am not so much fond of dogs). OK. This has been the third ruin pub that I toured with Budapest Flow, but where is the fourth one?! The last stop of the tour is a secret. (Sorry.) As this place is Attila’s little getaway from the omnipresent buzz in the city centre and it has been my popular place for quite some time, I reserve the right to not disclose it, but Attila would surely take you there if you go for the tour. Unlike in Prague, there is a vibrant Jewish community in Budapest and as I guess I am not the only one who has from time to time a sweet tooth, we also visited during the Budapest Flow tour a kosher sweet shop (cukrászda). One of a kind, kosher cake shop open since 1953 and serving a special Hungarian kosher cake called Flodni – a triple sandwich with nuts, apples and poppy seed on a layered dough. I did not try, but not because I did not want to! Budapest has many shopping halls where people from all over the country come and sell their goodies. This one is a newly renovated one that got opened only recently. I was posting about it on my Facebook page (see post below). You can still smell the fresh paint and there is a huge Spar inside too. The guided tour was also passing by several murals that decorate the city as a part of the Színes város (Colourful City) project. It was too dark to make nice pictures of the murals, luckily there are other people who did and who even know some tiny little details about them. Not a long time ago, the Czech magazine Reflex has been complaining about the lack of street food options in Prague. On the contrary, Budapest cannot complain about that. Not even a little bit. Funnily, the locals are already getting a bit tired of them (I heard a comment that it is all the time the same stuff, like really? ), but what else to wish for than for quality and tasty food that you grab on the street at an affordable price? The food trucks are just so popular in Hungary that they are showcased several times a year at festivals dedicated to them, they feed people at Sziget festival and even hungry party-goers at Kazinczy street – in a place called Karaván, Kazinczy u. 18. Feeling like ice cream or a sandwich from Mangalica meat (Hungarian master champion pig with curly hair)? This is the place to stop by! The last thing on my list that our group got to see is the street memorial of Karl Lutz – the saviour of 62,000 Hungarian Jews during the World War II. Read his stunning story here to find out what he did and why is the Danube quay called after him. There are hundreds of guided tours in Budapest and this one is not the only one offering a Jewish quarter wanderings. However this one has something special to offer and aims at a bit different audience (sorry, stag party boys!). The biggest advantage of this tour is the size of the group and the fact that it can be tailor-made according to your wishes. So, what I experienced is just one version of it. I would recommend it to people that want to be guided by the local, discover places that even Lonely Planet would not tell them about and get a gist of the ruin pub spirit without drinking one. Also, if you are not willing to spend 35 EUR for 3 hours of your life, then this is not for you. 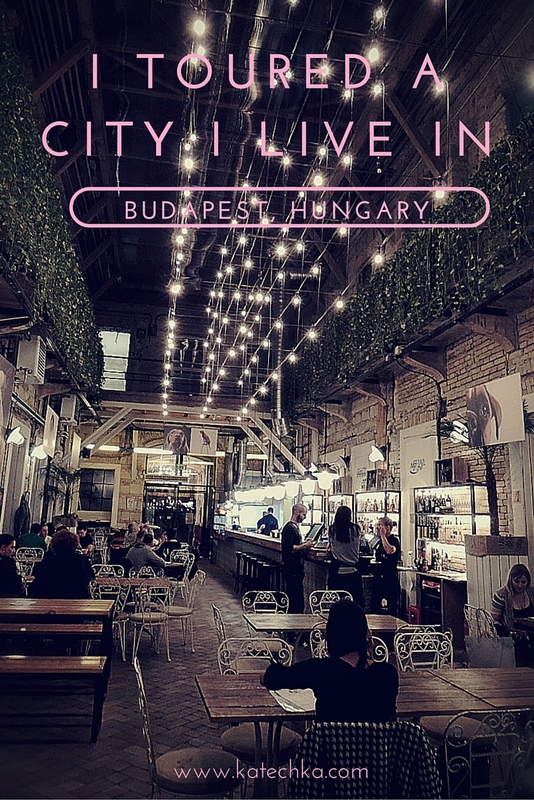 I believe, it is the sole chance to get in touch with a local guide and ask your curious questions that you might have about Budapest and life in Hungary in general. Attila is very knowledgeable and is even willing to answer your questions by e-mail after the tour. A guide that is hard to find! Just drop me a message and we can surely work out something. Ever tried to tour a city you live in? How was it? Drop me a comment below! Liked the post? Why not to Pin it? I really have to visit Budapest. 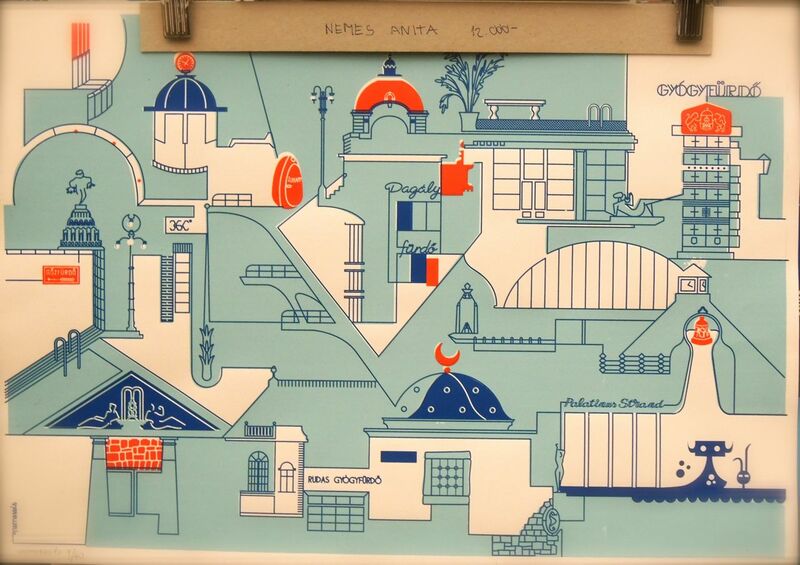 It´s a shame I never visited properly! And I want to go there so much more after reading this!